Ultrasonic jewelry cleaner, Isonic®, stainless steel / plastic / silicone / rubber, multicolored, 7-3/4 x 4-3/4 x 4-1/2 inches. Sold individually. 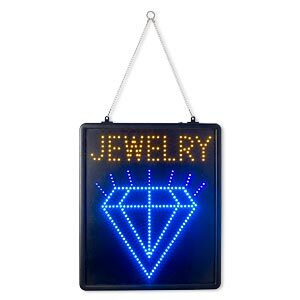 Sign, steel and acrylic with LED light, multicolored, 21 x 17-1/2 x 1-1/2 inch rectangle with "JEWELRY" and faceted stone with rays and 13-inch hanging chain. Sold individually. 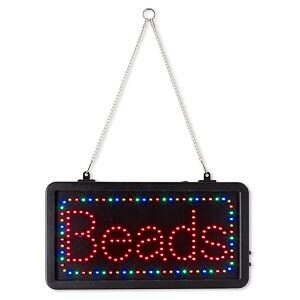 Sign, steel and acrylic with LED light, multicolored, 16-1/2 x 8-3/4 x 1-1/4 inch rectangle with "Beads" and 13-inch hanging chain. Sold individually. 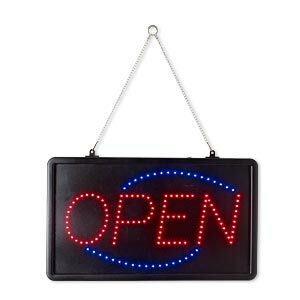 Sign, steel and acrylic with LED light, black/red/blue, 22 x 12-7/8 x 1-1/2 inch rectangle with "OPEN" and 13-inch hanging chain. Sold individually.